LAS VEGAS -- In the past five years, IBM's artificial-intelligence-fueled Watson has gone from being a game show champion to operating in such industries as finance, retail, health care and pure research. In another five years, Watson will be helping a doctor diagnose a patient's symptoms and a company CEO calculate whether to buy a competitor. 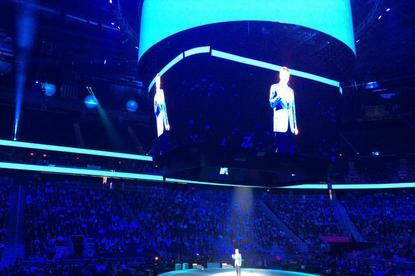 That's the word coming from IBM executives speaking Tuesday at the opening of the IBM World of Watson conference here. "The technology is not even moving fast. It's accelerating. It's moving faster and faster every day," said John Kelly III, senior vice president of Cognitive Solutions and IBM Research. "Honestly, it blows my mind and I'm an optimist." Ever since Watson, an intelligent system that uses machine learning and natural language recognition, beat Jeopardy champions in 2011, the system has been used in a variety of industries, and IBM is hoping to show how far it has come. However, Kelly wanted to focus on where Watson is going. "In three to five years, every single medical professional is going to want to consult Watson," he said. "How could you not use a tool to help you make the optimal decision on a patient? In three to five years, I can't imagine a company making a merger and acquisition decision without Watson." He added that it won't be long before Watson is predicting the future. Doctors, for example, may use Watson to help predict when a diabetic patient is about to have a blood sugar spike. "When that happens, then we truly, truly, have changed the world," Kelly said. Today, though, David Kenny, general manager of IBM Watson, said he is focused on what Watson can do with the growing flood of data that companies are struggling to manage. "Today, we are challenged to make sense of this vast amount of data we're creating," Kenny said. "The growth is far outpacing our ability to consume it." Companies could get out from under the data deluge with Watson processing all of this data, making sense of it and answering questions about it, he said. For Faisal Masud, Staples' chief digital officer, using Watson means helping customers sift through the company's huge online catalog to find the products they want. "With Watson, Staples is making ordering easy," Masud said during the keynote. "It's not just about ordering. At its core, with Watson, the Easy button is the assistant's assistant." Staples has turned its Easy button icon into an app that's powered by Watson. With the app, customers can text, talk or send a photo of what they're looking for and the app will order it for them. "The Easy button started as a marketing prop on TV," Masud said. "It became a cultural icon. In fact, it's a hash tag. It became so big, we wanted to give it life. With Watson, we can." The point goes beyond marketing, according to Masud. "It's about eliminating as much friction as possible for people who may be ordering a packet of pens to take to school, or for an office manager ordering cases of pens, ink cartridges and binders. "The Easy Button system learns over time and remembers common phrases and with every interaction it becomes more intuitive," he said. "Every time Dave asks for blue pens, Watson remembers what shade of blue he likes… Watson is the cognitive brain behind all of this." Steve Hill, U.S. head of Innovation and global head of Innovation & Investments at KPMG, said the accounting and professional services firm is using Watson to help make commercial loan decisions. "We can use it to process thousands of loans," Hill said. "Click on the name of the client to see all their loans and get Watson's assessment of their [standing] in a fraction of the time. There are major efficiency gains. Watson can help auditors glean deeper insights into root causes of issues." IBM is also placing some focus on self-driving cars. Sebastian Thrun, co-founder of Udacity, an online education company, and a former Google fellow, said A.I. systems like Watson will make automobiles better drivers than people. "When you and I drive a car and we make a mistake, we learn from it and hopefully we never make that mistake again," Thrun said. "But nobody else will learn from it. Our friends, our kids -- they won't learn from it." That's all different for autonomous cars driven by an artificial intelligence system. "When a self-driving car makes a mistake, it will learn from it and will never make that mistake again," Thrun said. "All the other self-driving cars also learn from that mistake. All other self-driving cars will learn that as soon as they are born. "Wait a little bit and Watson will outpace you," he added. IBM's Kenny said A.I.-based systems and machines will work with people to make their lives better and their jobs easier. "Our future is one of man and machine," he said. "It's certainly not man vs. machine." The conference continues through Thursday.